Right now you can pick up the Roku Ultra 4K streaming media player for just $79.99, which is $20 lower than it normally sells for. This price is actually the lowest it’s ever sold for, beating the previous low by $5. Roku makes some of the best streaming hardware, so if you’ve cut the cord already or are considering doing so, you’ll want to have one of these attached to your TV. The interface is easy to navigate, and most popular streaming services have apps available. You can easily access Netflix, Hulu, Sling, and HBO Now from dedicated buttons on the remote. There’s also a voice search feature built into the remote, and a headphone jack. 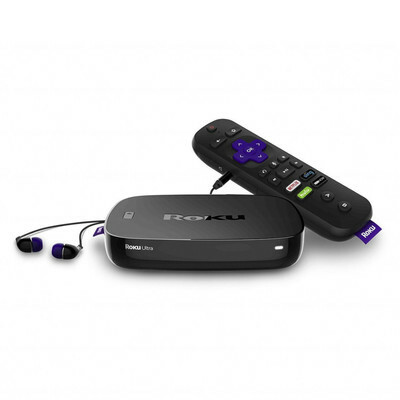 The Roku Ultra streams compatible content in 4K, and the box has a USB port and microSD slot. The Roku Streaming Stick is currently available for $39.99 as well. If you haven’t cut the cord, you should consider using your savings to check out DIRECTV NOW’s offer that scores you 3 months of service for $30. Not interested in 4K content but still want a Roku device? DIRECTV NOW has another promotion which scores you a free Roku Streaming Stick when you pay for one month of service. This makes it $35 for both the streaming media player and a month of access to DIRECTV NOW’s channel lineup. Odds are this discount won’t stick around for long, so be sure to grab one now, before it’s gone.